I didn't use any flash or special lighting, even though it was not easy to maintain the highlight outside the room and shadows inside. 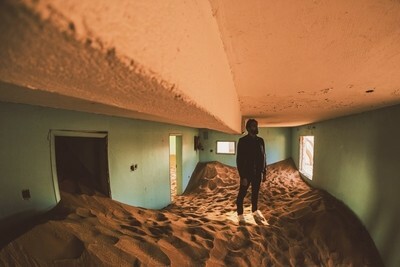 The place is insane!, it looks like it's on another planet, I was very happy to walk between these rooms and watch the sand everywhere. Many locations are often covered by many photographers in the same way, the challenge always is trying to make something different and unique.